The Loreto region is comprised of 8 provinces in the northeastern part of Peru that together cover almost a quarter of the landmass of the country. The region’s population (1 million people) is concentrated in Iquitos and a few other major cities, while the vast majority of the land (Amazonian rainforest) remains uninhabited. The population density averages out to 1-2 people per square kilometer. In preparation for this trip, we were asked to read La Doctora: An American Doctor in the Amazon by Dr. Linnea Smith, a physician from Wisconsin who decided to establish a clinic in Loreto (not too far from Iquitos) in the 1990s and provide care to the people who lived here. That is to say that we had some description of what we might encounter. Several things have struck me about this experience so far. First of all, the Hospital does fine with the resources that it has. Yes, it lacks the luxuries of a hospital with excess money to spread around, and its physical plant could use significant renovation, but it honestly seems that the conditions are no worse here than at some of the hospitals I have seen in the US. Even the big-name ones. Most of the equipment is old or showing wear and tear, but it does not mean that it works any less well. But on the other hand, Loreto struggles significantly with geographic, linguistic, and cultural barriers to care. Since there are no roads between villages here (and any significant travel must be done via slow and difficult to navigate waterways), sometimes the patients who need help just physically can’t make it to an local Punto de Salud (which itself can be anywhere from 6-20 hours by boat to the province capital’s Centro de Salud, which itself can be 6-10 hours by boat to the Regional Hospital in Iquitos). Factor in extreme poverty (making prohibitive both the access to transportation as well as the time investment in the trip to the hospital), lack of basic education, lack of cultural support for sanitary living conditions (such as drinking only pre-boiled water, or using hygienic practice for the latrine), and general distrust of what medicine can offer – this means that many people are not even coming in contact with the care they need. Despite all these challenges, I have found many more similarities than differences here. Some diseases might be more prevalent than others, and some barriers to access might be more difficult to overcome than others, but medicine is medicine, and public health is public health. Wherever you go, we all suffer the same types of diseases in the same ways. Physicians will always work to improve the lives of those who seek their care. We all want the same system-wide goals: access, coverage, quality, and safety. Medicine is people helping other people – talking to, caring for, and supporting each other. It doesn’t matter if one place has newer equipment, newer facilities, or more financial resources. It’s not just the transaction of goods and services that matters. Medicine is as much a social act as it is a physical thing such as an injection, a pill, or a tube. “Law 15: Learn empathy. Put yourself in the other person’s shoes, feelingly. When you find someone who shows empathy, follow, watch, and learn. Law 16: Speak up. If you see a wrong in the medical system, speak out and up. It is not only important to call attention the wrongs in the system, it is essential for your survival as a human being. It is sad that health care in America as a rule, has become so financially driven. That is not to say that everyone adheres to this. I recently started coaching a client to lose a major amount of weight through body weight exercise. It is such a joy to see dedication, desire, and a will to live. To watch the pain on a client’s face because they know what they have done to get to where they are, is a truly touching experience. To provide obtainable options for those that want it and not put myself first are important to me. I got off track but, it must be bittersweet to see the vast differences, yet subtle similarities. The best to you in your pursuit. I have such a poor perspective on what health care in other countries looks like, so I appreciated the pictures! Doesn’t look too different than the US, but what a difference in terms of access to healthcare. Like you said though, in the end, medicine is medicine wherever you are. Reblogged this on Public Health Freaks Consultants Blog. Yes, it is pretty amazing in regards to the discrepancies of 3rd world health vs the NA system. Our system is much more expensive though and I find the system to be a bit far fetched. For example the survival rate for chemo with colon cancer is 2%. Yet there still pushing chemo. I guess 2% is better than nothing. Still at bodybgood.ca we give you more than 2% survival rate for any type of cancer. I was just wondering if you have a working email address for the hospital? I’ve been trying to contact them recently but there website seems to be down. If you’re able to provide any way to contact them, it would be much appreciated! Hi Bekka — Unfortunately I do not know the email address of anyone at the hospital. There are no computers in the clinical areas, and I was never in an administrative area/worked with administration of the hospital. Sorry! I am also interested in reaching one of the doctors in the hospital. I am a medical student and would like to do a summer internship there. Did you manage to get any email adresses from anyone ? Reblogged this on Hanuman Chalisa Yantra. I just really likes the title of this post ! Reblogged this on Senior University Press. Reblogged this on Jeffry Schneider Austin. We so often think our world is different than people in different countries. We are very similar. “People treat people” no matter where you go. The healthcare world is interconnected worldwide. Thank you for your very intersting take on the conditions at the Hospital Regional de Loreto. 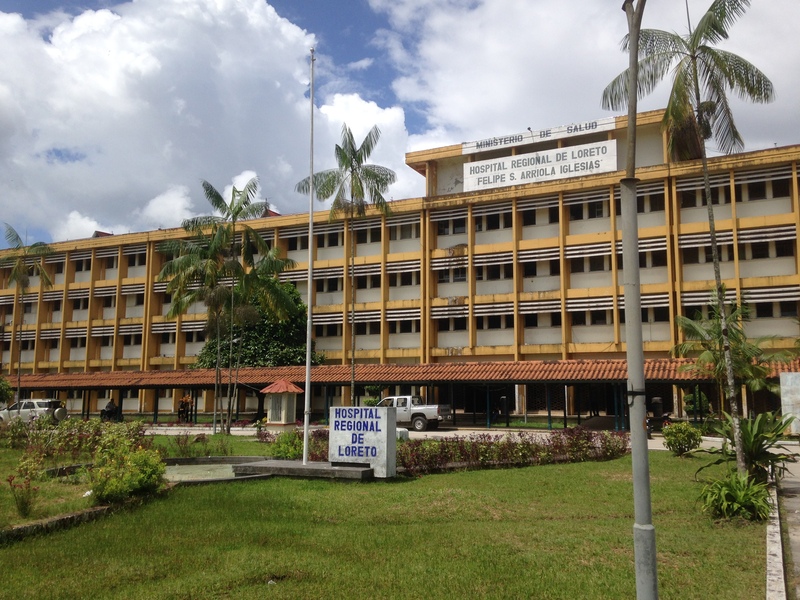 I am a fourth year medical student in France and would like to do my summer clinical rotation (July and and August 2017) in one of the units of this hospital, as my university allows us to go abroad for the summer and this region of Peru fascinates me. Would you happen to have the contact information of doctors working at the hospital I could get in touch with ? Email adresses are very hard to find on the internet.